The current Constitution of the Russian Federation ">[kənsʲtʲɪˈtutsɨjə rɐˈsʲijskəj fʲɪdʲɪˈratsɨɪ]) was adopted by national referendum on December 12, 1993. Russia's constitution came into force on December 25, 1993, at the moment of its official publication, and abolished the Soviet system of government. The current Constitution is the most long-lived in the history of Russia, except for Stalin's constitution. Presidential copy of the Constitution. The current Constitution of the Russian Federation (Russian: Конституция Российской Федерации, Konstitutsiya Rossiyskoy Federatsii; [kənsʲtʲɪˈtutsɨjə rɐˈsʲijskəj fʲɪdʲɪˈratsɨɪ]) was adopted by national referendum on December 12, 1993. Russia's constitution came into force on December 25, 1993, at the moment of its official publication, and abolished the Soviet system of government. The current Constitution is the most long-lived in the history of Russia, except for Stalin's constitution. The 1993 Constitutional Conference was attended by over 800 participants. Sergei Alexeyev, Sergey Shakhray and sometimes Anatoly Sobchak are considered as co-authors of the constitution. The text of the constitution was inspired by Mikhail Speransky's constitutional project and current French constitution. A constitutional referendum was held in Russia on 12 December 1993. Of all registered voters, 58,187,755 people (or 54.8%) participated in the referendum. Of those, 32,937,630 (54.5%) voted for adoption of the Constitution. 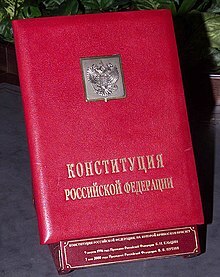 It replaced the previous Soviet-era Constitution of April 12, 1978 of Russian Soviet Federative Socialist Republic (which had already been amended in April 1992 to reflect the dissolution of the Soviet Union and the sovereignty of the Russian Federation), following the 1993 Russian constitutional crisis. Russian #politics and the political system are laid out in a framework where the country is led by the President along with the Prime Minister and his ministers. Russia: Sovereignty, Authority, Power, Political Institutions. After 1999 when Vladimir Putin assumed power in Russia, Russians lost the Constitution of the Russian Federation.